The Crown Prince Shawl is coming along nicely if I do say so myself! Nearly at the half way point for the body. The nupps are getting a little tedious, and the pattern is repetitive. 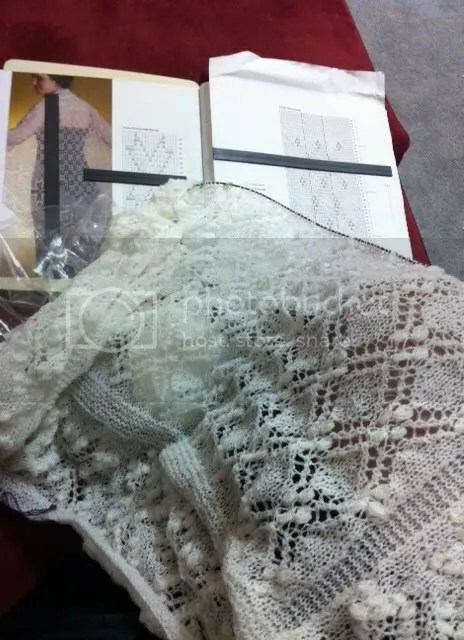 This last part makes it particularly good TV knitting at the end of a long day! Nothing else to report at this juncture. We’ll discuss things more privately perhaps? i do love getting your blog in my box every week, in fact i look forward to it. it inspires me to doing my own one day. i want to buy Tan one of your creations or commision you to do a lovelly shawl. Daw! So sweet! I’m sure we can come to an arrangement!